At the February session, the 2018 Emerging Leaders Program class was honored to host Walt Humann and learn about his life’s work impacting and influencing change throughout Dallas. The session concluded with a discussion about interpersonal skills and the impact of trust in leadership. 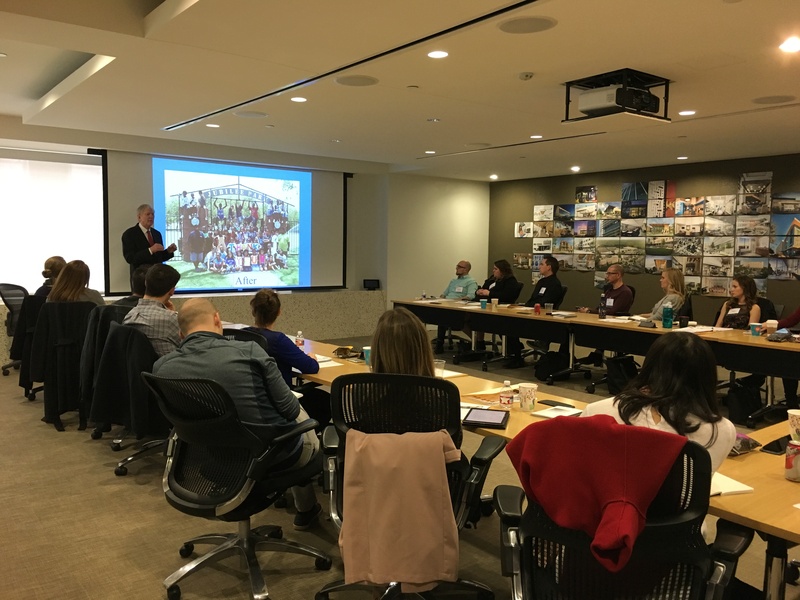 This month’s session of ELP, a program geared towards the next generation of architect leaders, kicked off with guest speaker, Walt Humann speaking to the class about his life, career, and efforts in public service that have shaped some of Dallas’ most notable civic projects and infrastructure. A humble man grounded by a passion to have an impact improving the lives of others, Walt described some of his most significant projects to the class. To list a few, these included: championing the Transportation Task Force responsible for bringing the DART light rail system to North Texas, chairing the North Central Task Force responsible for improving the North Central Corridor, founding and chairing the Dallas Alliance which developed the DISD Desegregation Plan, and helping form the DISD Charter School program. Now his eyes are set on revitalizing Fair Park and the surrounding areas. Following his presentation, the class held a Q&A session with Walt to dive into challenges facing Dallas today. Walt described some of the challenges that can impact community leadership such as lack of diversified representation, poor voter turnout, and lack of trust in businesses and charitable organizations to name a few. When asked how he was able to take on such big civic endeavors and maintain the momentum of change, Walt described to the class the importance of volunteers and their role in the success of a project. Often the leader’s job is to help build the same passion and energy for change in others to accomplish the mission you are collectively trying to conquer. Walt challenged the Emerging Leaders group to not back down from a problem that one may feel is too large. He also implored us to understand that sometimes failures are just as notable as the successes, so learn from them. We as architects have to take a stake in the game and contribute to our community growth as leaders to the cause. It may not be an immediate impact but persistence and dedication are two key takeaways that will help keep us on the right path. The class concluded with discussion led by class instructor Pete DeLisle, Hon. TxA, a former executive of several international companies, on interpersonal skills and the impact of trust in leadership. Pete illustrated the shifting roles architects transition through as they advance within a firm. One’s time shifts from being spent solving technical problems to managing how resources are utilized within the firm, but the constant throughout this change is a core foundation of interpersonal skills. Pete concluded by emphasizing that trust is the “zero multiplier” and reiterated that without trust from others, one cannot be a successful leader.